Sugar cookies are among the simplest varieties of baked goods, but their simplicity carries with it a degree of elegance. The same basic recipe can be used with equal success at a children's birthday party or a more formal occasion, depending how the cookies are cut and decorated. 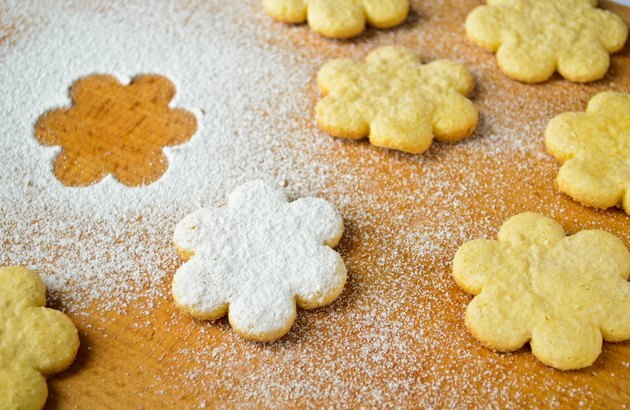 Most sugar cookies rely on a short list of ingredients including butter, sugar, flour and eggs. However, if you're unable to use eggs because of a food allergy or vegan in your household, there are alternatives. Eggs are important to cookies. The emulsifiers in egg yolks help combine wet and fat ingredients, producing a smooth dough that's not prone to separating. The yolks add richness and color, and help soften a cookie's texture. The proteins in the whites help provide structure, contributing to the cookie's texture. No single ingredient is as versatile as eggs, making them difficult to replace. Fortunately, the texture and small size of cookies means they're much easier to adapt for eggless baking than cakes or other baked goods. There are two main types of egg replacers on the market. The first type is aimed at those who want to reduce calorie and cholesterol consumption, and consist primarily of egg whites, with some oil and other ingredients added to compensate for the missing yolk. The second variety is aimed at those who want to avoid eggs entirely, either because of an allergy or for other reasons including vegetarianism. This type is made from varying proportions of starches, leaveners and cellulose, which form an egg-like consistency when mixed with water. Either type works well in sugar cookies. Another egg replacer widely used by vegans and those with egg allergies is flax seed. When whole, flax seed is largely indigestible, and is treated by your intestines simply as fiber. However, when ground and mixed with water, flax forms a slightly gummy, gelatinous liquid that can be used as an egg replacement in most baked goods. It provides a texture similar to cookies made with eggs, and as an added bonus ground flax contains high levels of healthy omega-3 fatty acids. In some recipes, a slight increase in fat and leavening will replace eggs. For each egg called for, stir together 1 1/2 tbsp. each of water and oil with one teaspoon of baking powder. Gelatin, a protein similar in many ways to egg whites, is also a useful replacement. For each egg mix one envelope of unflavored gelatin with 2 tbsp. of warm water, and add it to the recipe once it's fully moistened. Some recipes use an ingredient such as sour cream or cream cheese as their base, providing a texture similar to conventional sugar cookies without using eggs.